Syrian rebels hit southern city of Suweida, until now untouched by the conflict, as army gears up for major Damascus operation. A rare car bomb attack in the southern Syrian city of Suweida has killed at least eight people Wednesday, including a Syrian army colonel, according to the Syrian Observatory for Human Rights. The attack took place outside the military intelligence headquarters, and wounded dozens more. Suweida is populated mostly by members of the country's minority Druze community, and is considered a regime stronghold. Until now it had managed to avoid the ongoing violence elsewhere in the country, which has killed at least 115,000 people according to UN estimates. Clashes reportedly broke out in the aftermath of the explosion, according to Rami Abdelrahman, who heads the Observatory. 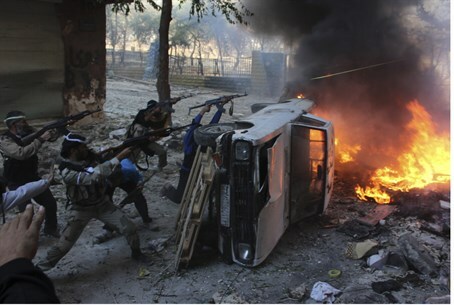 The dead are all believed to be members of the Syrian security forces. That attack came only hours after state media reported that an "improvised car bomb" had detonated in the center of the capital Damascus, killing eight people. At least 50 people were wounded in that attack, according to SANA news agency, which targeted the city's crowded Hejaz Square. But the British-based Observatory claimed the casualty count in that attack was lower - citing 7 dead and and at least 20 wounded. It further cited conflicting reports from its network of activists as to whether the explosion was indeed the result of a car bomb, or a mortar shell strike. Syrian rebels have managed to seize several suburbs of the capital, but regime forces have succeeded in containing their advances and have repelled numerous attempts to push further into central Damascus. The rebels' inability to make significant territorial gains in the heart of the city has resulted in an increased use of car bombings and other improvised explosive devices, in an attempt to wear down pro-regime forces. The attacks come as the Syrian army and its allied foreign militias are reportedly mobilizing for a large-scale operation aimed at ejecting rebel forces from the Damascus area and cutting off their access to neighboring Lebanon, in what could mark a significant escalation in the conflict, as the country's civil war enters its third year.